Each industry has its own requirements. That is why we have designed ID card solutions that fully answer the needs of your market. Find out now how to build a successful card program for your company, school, healthcare facility, government office, event venue, or retail store. How do you identify visitors, and control access to premises for a safer workplace? ID card solutions that have been designed to meet the requirements of schools of all sizes. Doctors, nurses, staff and visitors with secure ID badges. Government IDs require a very high level of security. Today, retailers of all sizes heavily rely on loyalty cards and gift cards to boost their sales and attract new customers. Employee ID badges and customer passes have become commonplace in the transportation industry. One-stop provider for all your ID needs: With our extensive line of ID solutions and supplies, you will find the perfect ID system to print professional employee IDs, visitor IDs or access control badges! Whether you need visual IDs or multi-feature badges, we have the right solution! Premium customer service: Our team has been trained to guide you and assist you before, during and after your purchase. Call us toll-free at 1-800-897-7024. Certified repair center: ID Security Online is a certified repair center for all the major brands. If needed, our tech support team will fix your machine fast! Loaner program: If your card printer is being serviced at our repair center, we'll send you a loaner printer so you can print replacement IDs for your employees or visitor passes. Fair price guarantee: If you find a lower price from another retailer, send us the quote and we will beat it! A trusted name in the ID industry: Check out what our customers say about us through customer testimonials and our ResellerRatings page. How do you identify your employees and visitors, and control access to your premises for a safer workplace? With secure ID badges! 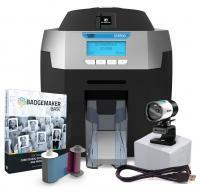 Design and issue photo IDs with your logo, text and pictures. Print professional badges for each employee but also for your visitors. Not only will you keep track of who is in your premises at all times, but you will also leave a great first impression to potential clients. For a higher level of security, add a barcode or encode data on a magnetic stripe or smart card. Your ID cards become multifunctional badges and may serve for time and attendance and access control to company property. All you need is the right ID card system! IDSecurityOnline offers an extensive line of card printers, ID systems, supplies and accessories to answer the need of every business. Whether you are a small business or a large corporation, IDSecurityOnline has the perfect ID solution for you! IDSecurityOnline makes secure IDs available to all businesses by offering affordable, easy-to-use ID card systems. IDSecurityOnline has designed ID systems that include everything that you need to start printing professional IDs within minutes! 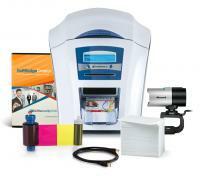 Each system includes an ID card printer, full-featured software, a camera, a color ribbon and cards. IDSecurityOnline promotes small business in the United States and offers special pricing to companies with less than 50 employees. To benefit from this unique opportunity, call us today at 1-800-897-7024. Today more than ever, your business can�t afford to be careless when it comes to security. Your employee ID cards can now be integrated with access control systems to secure restricted areas and company computers and networks. From magnetic to smart contact or contactless cards, businesses now have access to a wide array of technological options. Magnetic cards store secure information on a magnetic stripe and need to be swiped, while smart contactless cards (RFID) just need to be waved in front of a reader. This option is more and more appreciated by large companies as it allows a high number of people to access the premises quickly and securely. IDSecurityOnline offers ID card solutions that have been designed to meet the requirements of schools of all sizes. ID cards have been widely adopted in all educational structures: not only do they help keep students and staff safe but they also make daily tasks much easier to manage. For example, a photo ID badge can help you visually identify students, staff and visitors, but it can also be used to control access to your school, manage equipment checkouts and lunch programs, and even pay for campus purchases. Getting the right ID card system is the most effective and affordable way to secure your school. Implementing and maintaining an ID card program will help you keep track of who is in your premises at all times. Design professional IDs for each student, employee and visitor. For added security, add a bar code or encode data on a badge with magnetic stripe, or a smart card. Using magnetic or smart cards will turn your badges into multi-purpose IDs. The same ID card can then be used to access secure areas, check out books or pay for lunches. ID Security Online has designed ID card systems that are suited for your specific needs. For a free ID consultation, call 1-800-897-7024 or email us at [email protected]. ID cards have been playing a significant role in colleges and universities for quite some time. Today, the latest technological innovations in smart cards have changed ID badges into powerful tools to manage every single aspect of campus life. Control access to your campus with magnetic stripe, proximity card, or smart card technology. The same system can also be used to limit access to technology such as computer rooms. Your students can even use their ID card as a debit card to pay for food, books and other on-campus purchases. A cashless system helps reduce lines and wait times while allowing users to keep track of their expenses. 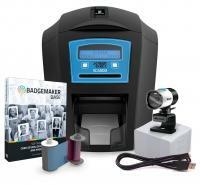 ID Security Online offers a wide variety of ID card printers with smart card encoders. Whether you need basic photo ID badges or multi-purpose IDs, ID Security Online has the perfect solution for your school. Hundreds of colleges and universities already trust ID Security Online to get the right ID card system. To get yours, call 1-800-897-7024 or email us at [email protected]. Identify doctors, nurses, staff and visitors with secure ID badges. Knowing who is in your facility and in which area is critical to ensure the safety of all, but also a smooth flow of people. Basic doctor and nurse IDs include the cardholder�s name, department, title, and picture. Visual IDs help you determine at a glance if a given person is allowed in the premises or if this person is an intruder. Magnetic and smart cards are a great choice to store data and control access to your hospital. Magnetic cards store secure information on a magnetic stripe and need to be swiped. Smart cards are a prime choice for patient ID and insurance cards. The patient information is stored on an embedded chip. This process speeds up registration but also offers a secure and efficient way to access quickly critical information such as health records, allergies, and medications. In an industry where every minute counts, ID cards can help save lives. More and more healthcare facilities go even further to secure their badges and opt for laminated badges. Adding a hologram or a patch to your ID cards significantly reduces the risk of fraud and counterfeiting. It also extends the lifespan of your cards, making them more durable. 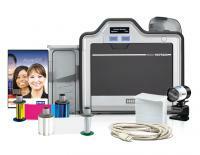 You can print your own laminated badges with a card printer that includes a lamination module. IDSecurityOnline offers the ID card systems that your hospital needs to keep staff and patients safe. Whether you need to print visual IDs, secure IDs on magnetic or smart cards, or laminated badges,IDSecurityOnline has the perfect solution for your facility. Government IDs require a very high level of security. It is critical to protect the information contained in driver�s licenses, national ID cards, or government employee badges. A security breach might have disastrous consequences for the card holder, but also for the administrations involved. That�s why government agencies cannot afford to make the wrong choice when implementing and maintaining their ID card program. Thankfully, many options are now available to issue highly-secure badges. The first solution is to apply holographic overlays or patches to the card. This process significantly reduces the risk of fraud and counterfeiting, while extending the lifespan of your cards. Most government agencies even use custom holograms: designing a custom film makes badges completely unique and extremely secure. The second option is to encode data securely in the card. Contact or contactless smart card technology is a proven solution to store valuable information in a chip. Finally, access to your ID card printer needs to be restricted to prevent intruders from getting key data. 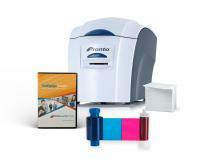 Most laminating card printers now include locking devices and password protection. IDSecurityOnline has already provided numerous government agencies with secure ID card solutions. Our expertise and experience of government projects allow us to meet the strictest requirements. From FIPS 201-compliant ID card systems to the latest laminating card printers, we have the ideal solution to your needs. Organizing and managing a successful event is demanding and can quickly become overwhelming, especially when it comes to identifying staff and attendees. Security concerns are high, especially in large events such as concerts and sporting events. The challenge is complex: issuing ID cards on the spot and at a steady pace to reduce lines at the registration desk, control access to the venue and ensure a smooth flow of attendees and visitors. The solution lies in choosing the right ID card system... and the right ID partner! 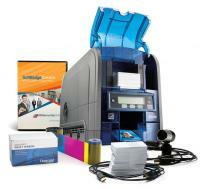 IDSecurityOnline.com offers an extensive line of card printers, ID systems, supplies and accessories, to answer the needs of every type of event, regardless of its size or location. Print ID badges for your exhibitors, visitors, staff and guests. Event badges can be basic IDs with the name of the visitor and/or a picture. Add a barcode to further control access to your venue and keep track of traffic at entry and exit points. For increased security, encode data on a badge with magnetic stripe, or a smart card. Magnetic cards store secure information on a magnetic stripe and need to be swiped, while the information in a smart card is stored on an embedded chip. The benefits of these card programs are multiple. They help establish a relationship between a retailer and its customers. In the process, the retailer gets key information about the profile of its buyers: who they are, what they buy, when they visit a store, etc. All these elements are powerful tools to segment your marketing actions and send targeted communications to clients. In exchange, the customers� loyalty is rewarded through discounts, gifts and special promotions. Loyalty cards also make customers feel special and valued by a brand. They are therefore more likely to repeat purchases more often. Gift cards have also become extremely popular. They encourage people who might not otherwise visit your business to take a look around and likely return to make additional purchases. Plus, as people purchase gift cards for their friends on birthdays or holidays, your brand continues to be dispersed among new customers. The good news is you don�t have to be large retailer to issue membership, loyalty or gift cards. All you need is an ID card system to design and print professional ID cards. Print unique cards with your logo, company name and information. The most common system features an ID card printer with a magnetic encoder so that customers� balances and activities can be tracked with every card swipe. The same ID card system can also be used to identify your staff, contractors and even VIP guests. Your customers will identify your sales team at a glance and you will keep track of who enters secure areas of your facility at all times. Most ID card systems are easy to integrate with your POS system. To find the ID card solution that is right for you, contact IDSecurityOnline today. Employee ID badges and customer passes have become commonplace in the transportation industry. Employee badges are typically printed on magnetic or smart cards as these cards are also used to control access to specific areas. The magnetic stripe technology is also widely used for customer passes: the rider swipes the card when boarding, allowing access while deducting the fare from the customer�s balance. Plastic cards are a better choice than paper passes for monthly or annual passes. More durable, they won�t wear out or get damaged from regular use. Recently, large public transportation systems have opted for smart contactless cards. These cards can store a large amount of data securely while offering convenience to the user. The rider only needs to wave the card in front of the reader, and access is granted. This system allows more people to go through much faster, reducing at the same time the ecological impact of paper tickets. Contactless smart cards are also ideal for parking lots and ramps, allowing fast access without time-consuming payment at exits. Also used for parking meters, these cards allow convenient, cash-free parking. These passes can be personalized and printed onsite with an ID card system from IDSecurityOnline. Reliable and easy-to-use, our ID card systems will help you print all your transportation passes on demand.